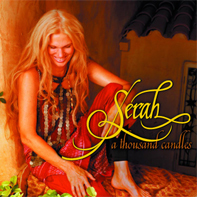 “A Thousand Candles” is Serah’s love letter to the world. The imagery is worthy of Thoreau and Emerson, all nature, romance and peace in “Wind in Their Manes,” “Oysters and Stars” and “Mountains of Luberon,” , while her clever “Download” invites the listener to “download that harmony” which is just what happens. Packing your wings and moving on. Lifts up the wings of pure desire. When all the heart and mind agree..
Til it echoes back around ? The angels know my history. The urge to love uplifting my scarlet Ibis wings. Summer dreams are fading, now the Mother song calls me home…. The Mother song calls me home…. Love holds the balance of the world – Love holds the balance….